In the Crossfire: Is nuclear power safe? Is nuclear power the path to energy independence or a deadly danger? Ahead of the 9pm ET premiere of CNN Films' Pandora's Promise, host Newt Gingrich and our guest host, former Montana Gov. Brian Schweitzer, explore the topic of nuclear energy tonight at 6:30pm ET. Joining the debate is consumer advocate Ralph Nader, who opposes nuclear power, and Michael Shellenberger, a nuclear energy supporter featured in the film. We want you to weigh in: Are you afraid to live near a nuclear power plant? Vote by tweeting with yes or no #Crossfire or comment on our Facebook post. View results below or through our Poptip results page if you are on a mobile device. For five years since it was founded, Chava Energy LLC tried to promote itself chiefly by means of false and fraudulent claims and pretenses, that it was developing “revolutionary energy breakthroughs,” including “Fractional Hydrogen” engines utilizing nonexistent states of hydrogen, magical Ambient Temperature Thermionic Converters, and magnetic generators supposedly harnessing Zero Point Energy. Recently, much of the material containing these false and ludicrous claims was suddenly removed from the Chava Energy website, although much of the flimflam related to Zero Point Energy still remains. Hagen Ruff, the CEO and Co-founder of Chava Energy, was certainly well aware of the false and fraudulent nature of Chava Energy’s claims and pretenses during five years before the material was removed, and we hold him responsible for the very low standard of honesty which they reflect. 1. After claiming for five years that Chava Energy LLC was some sort of “leader,” Hagen Ruff finally showed some leadership for the very first time by quietly ejecting Chava Energy’s Co-founder, Chief Market Research Officer and Number Two Charlatan, Mark Goldes. Unfortunately, Hagen Ruff left in place the company’s Number One Charlatan – namely, Hagen Ruff. It was not Mark Goldes, but Hagen Ruff, who chose Mark Goldes to be his co-founder and partner at Chava Energy, even though Mark Goldes’ character as a professional fraud artist would not have been more obvious if it were stamped on his forehead. And Chava Energy’s five years of fraudcraft have left no room for any doubt that Ruff chose Goldes not in spite of Goldes’ talent for unscrupulous fraud, but precisely because of it. But never mind that. We still have more reasons to thank and congratulate Hagen Ruff! We thank and congratulate Hagen Ruff not only for ejecting Chava Energy’s Chief Swindler Mark Goldes, but also for dropping from Chava’s website no less than four out of five of the major heaps of fraudcraft presented by Chava Energy since it was founded. Only one heap remains: the heap known as their Zero Point Energy powered ZPE Generator. If the RNC wasn't for nuclear power, than most of the left would be for it. All forms of power have risks – this one has the least risk and the most reward. Make it happen. Not true at all. I was a Republican for years – went to the local caucus meetings and everything, but I was always against nuclear power because of the problem with the waste. The term 'risk' doesn't even apply to waste. That's something we know will happen – waste getting released. It already has three times and, of course, will again many times during the next 250,000 years. Mark Goldes, starting in the mid-seventies, engaged for several years in the pretense that his company SunWind Ltd was developing a nearly production-ready, road-worthy, wind-powered "windmobile," based on the windmobile invented by James Amick; and that therefore SunWind would be a wonderful investment opportunity. After SunWind "dried up" in 1983, Goldes embarked on the long-running pretense that his company Room Temperature Superconductors Inc was developing room-temperature superconductors; and that therefore Room Temperature Superconductors Inc would be a wonderful investment opportunity. He continues the pretense that the company developed something useful, even to this day. And then Goldes embarked on the pretense that his company Magnetic Power Inc was developing "NO FUEL ENGINES" based on "Virtual Photon Flux;" and then, on the pretense that MPI was developing horn-powered "NO FUEL ENGINES" based on the resonance of magnetized tuning-rods; and then, on the pretense that his company Chava Energy was developing water-fueled engines based on "collapsing hydrogen orbitals" (which are ruled out by quantum physics); and then, on the pretense that he was developing ambient-heat-powered "NO FUEL ENGINES" (which are ruled out by the Second Law of Thermodynamics). Goldes' forty-year career of "revolutionary invention" pretense has nothing to do with science, but only with pseudoscience and pseudophysics – his lifelong stock-in-trade. I have spent months investigating the career of Mark Goldes, Aesop Institute's Perpetual Scam Machine. 1976: Goldes seeks investors with fraudulent claims to have developed a nearly production-ready, road-worthy, wind-propelled, wind-rechargeable "windmobile" that could reach 60 mph. Goldes has never developed any roadworthy windmobile. 1998: Goldes fools the gullible US Air Force with his "room temperature superconductor" scam, receiving over four hundred thousand dollars in "Innovative Research" grants. Goldes has never produced any superconductor. 2005: Goldes seeks investors with fraudulent claims that his company, MPI, is developing "Magnetic Power Modules" based on "Virtual Photon Flux." 2008: Goldes seeks investors with fraudulent claims that "MPI is also developing breakthrough magnetic energy technologies including POWERGENIE (Power Generation of Electricity by Nondestructive Interference of Energy)." The basic idea of POWERGENIE is to generate electricity from sound energy, by blowing a horn at a magnetized tuning rod. Goldes claims to have "run an electric car for more than 4,800 miles with no need to plug-in." According to Goldes, "[MPI] Revenues from licenses and Joint Ventures are conservatively projected to exceed $1 billion annually by 2012." "For the past five years Mark Goldes has been promising generators 'next year.' He has never delivered. Like 'Alice in Wonderland' there will always be jam tomorrow, but never jam today." – Gruber's comment was written almost five years ago – but it's just as true today – except that MPI, Goldes' corporation that he claimed would bring in one billion dollars in revenue from his horn-powered generator in 2012, is now defunct, having never produced any "Magnetic Power Modules" – just as his company called "Room Temperature Superconductors Inc" is also now defunct, having never produced any "room temperature superconductors." Evidently there's a limit to how many years in a row the same company can claim it will finally have something to demonstrate "next year." Now Goldes has a new scamporation, Chava Energy. Goldes' current favorite scam is an engine that would run on ambient heat only – which is ruled out by the Second Law of Thermodynamics. But of course, the laws of physics always make an exception for the scams of Mark Goldes. Mark Goldes is a textbook-ready example of a highly talented con artist who clearly takes pleasure in fooling people with his ludicrous claims, artfully peppered with pseudoscientific rubbish. Make no mistake: Mark Goldes' scamtastic Aesop Institute is a ZERO-STAR nonprofit. Let's look at just one example of Goldes' offerings in "revolutionary new technology:"
Most Ludicrous Scamvention: Mark Goldes' "POWERGENIE"
One of the most laughable of Mark Goldes' many invention scams is his "POWERGENIE" horn-powered generator. The brilliant idea of this revolutionary breakthrough is to blow a horn at a magnetized tuning rod, designed to resonate at the frequency of the horn, and then collect the electromotive energy produced by the vibrations of the rod. [The device incorporates] "an energy transfer and multiplier element being constructed of a ferromagnetic substance... having a natural resonance, due to a physical structure whose dimensions are directly proportional to the wavelength of the resonance frequency..."
"In this resonant condition, the rod material functions as a tuned waveguide, or longitudinal resonator, for acoustic energy." "Ferrite rod 800 is driven to acoustic resonance at the second harmonic of its fundamental resonant frequency by acoustic horn 811, resulting in acoustic wave 816 within the rod having two nodal points... Bias magnet 801 produces magnetic flux 802 extending axially through both nodal points developed within rod 800... The sum electromotive force of coils 820 and 821 develops electrical current and power in resistive load 830." – But the patent doesn't tell us who is going to volunteer to blow the horn at the rod all day. Perhaps it will come with an elephant. Goldes claimed in 2008 that this wonderful triumph of human genius would bring his company, Magnetic Power Inc, one billion dollars in annual revenue by 2012. Magnetic Power Inc is now defunct, having never produced any "Magnetic Power Modules" – just as his company called "Room Temperature Superconductors Inc" is also now defunct, having never produced any "room temperature superconductors." Mark Goldes' proofless claims regarding his make-believe strictly ambient heat engine do not represent any new technology, or even a new pretense – they merely represent a rather old pretense. "Before the establishment of the Second Law, many people who were interested in inventing a perpetual motion machine had tried to circumvent the restrictions of First Law of Thermodynamics by extracting the massive internal energy of the environment as the power of the machine. Such a machine is called a "perpetual motion machine of the second kind". The second law declared the impossibility of such machines." "A perpetual motion machine of the second kind is a machine which spontaneously converts thermal energy into mechanical work. When the thermal energy is equivalent to the work done, this does not violate the law of conservation of energy. However it does violate the more subtle second law of thermodynamics (see also entropy). The signature of a perpetual motion machine of the second kind is that there is only one heat reservoir involved, which is being spontaneously cooled without involving a transfer of heat to a cooler reservoir. This conversion of heat into useful work, without any side effect, is impossible, according to the second law of thermodynamics." Goldes' make-believe strictly ambient heat engine would be a perpetual motion machine of the second kind, as defined above. Goldes is not developing any such engine; he is merely developing a pretense – as usual. Wind needs 118,881 acres or 13% of Rhode Island just over half of New York City. We are destroying the world with coal plants, fracking and the burning of fossil fuel. Embrace all forms of clean energy: solar, wind and nuclear. Instead of fighting against nuclear, US politician need to stop approving military actions in every conflict around the world. That money need to go to our schools so our kids get affordable education. Our kids are smart and they can make solar and wind a reliable source of energy, if they have the proper education and research money. The US has a good record with nuclear and our kids can make it even better. Chernobyl was an unsafe plant from the begging. It did not have a containment building. Fukushima was an act of nature and as we know nature can be devastating. Nature will be more devastating if we do not stop global warming. The world is moving backward Japan is opening more coal plant. Read about AP100 reactor. Also, batteries and super capacitors for wind and solar energy. This is what we should strive for. Better technology and a cleaner world. I hope my kids and grandkids have the chance to enjoy the world because we are shortening the earth life. Mark Goldes' proofless claims regarding his Aesop Institute's make-believe strictly ambient heat engine do not represent any new technology, or even a new pretense – they merely represent a rather old pretense. Goldes' strictly ambient heat engine would not merely "circumvent" the Second Law of Thermodynamics – it would actually DISPROVE the Second Law of Thermodynamics. In the make-believe strictly ambient heat engine there are not two heat reservoirs at different temperatures; no reservoir would be available at any temperature other than the ambient temperature. No matter what cycle we design with this constraint, we will find that the cycle would have to be able to decrease the entropy of the universe in order to do any work. The formulation of the Second Law of Thermodynamics as a constraint on entropy change is one of the most beautifully simple, and well-established, laws of physics. The entropy change differential due to heat transfer to or from a reservoir is inversely related to the temperature at which the transfer occurs. The consequence is that transferring heat INTO a cold reservoir produces a larger GAIN in entropy, than the LOSS of entropy that occurs due to transfer of the same amount of heat FROM a hot reservoir. This noteworthy and remarkable inequality enables a heat engine to use some heat to do some work without violating the Second Law – as long as it can make use of two different heat reservoirs, at different temperatures. The ambient-heat-powered engine only involves a single reservoir, at a single temperature (at any given moment). When it reduces the entropy of the reservoir by using some of the heat to do work, it has no way to compensate by increasing the entropy anywhere else. Therefore we know for certain that the engine will disappoint us. It will never be able to do any work. In Mark Goldes' patent application for his "POWERGENIE" horn-powered tuning-rod engine, he described the tuning-rod as "an energy transfer and multiplier element." Goldes' use of the term "energy multiplier element" reflects his pretense that the "revolutionary breakthrough" of the amazing "POWERGENIE" could disprove the law of conservation of energy, by presenting the world with a working "energy multiplier." Goldes even claimed in 2008 that the POWERGENIE had been demonstrated already in an electric car, driven 4800 miles by his energy-multiplying horn-powered tuning-rod. But it seems that most people, for some reason, had difficulty accepting the notion that the law of conservation of energy could be proven false. And Goldes no doubt noticed that the Second Law of Thermodynamics – that "the entropy of an isolated system tends to increase with time and can never decrease" – is much less clear to most people than the conservation of energy. So now, after leaving aside the pretense that he could somehow "multiply energy" with a magnetized tuning-rod, Goldes has chosen to focus, instead, on the pretense that he can disprove the Second Law with an engine powered by ambient heat. There is no "new science" in any of Goldes' "revolutionary breakthroughs." There is only pseudoscience and pretense – and nothing new, at all. An engine that only uses ambient heat would need to be able to DECREASE the entropy of the universe. The Second Law of Thermodynamics tells us that we can never decrease the entropy of the universe, or of an isolated system. The NO FUEL ENGINE prototype program will speak for itself. When a desktop engine functions as anticipated, it will reflect new science and provide hope for a far more rapid replacement of fossil fuels. It will surprise legions of those who are certain it cannot be possible. Comments that reflect arrogance, ignorance and false accusations justify no further reply. Anyone who still doesn't understand how filthy and dangerous nuclear energy is should go to the highly recommended site called ENENEWS and read the past headlines. There is no perfect solution but Nuclear is the best option. It is far (FAR) from filthy. Have you ever been to a plant? They are extremely clean. It is people like you that are make fossil fuels more prominent and make the world more filthy. Fukushima fuel rods are scheduled to begin being removed this week. "Overall, more than 11,000 fuel assemblies are scattered around the Fukushima site. According to ...former Department of Energy official Robert Alvarez, there is more than 85 times as much lethal cesium on site as was released at Chernobyl. Source: Global Research We are now (approaching) what may be humankind's most dangerous moment since the Cuban Missile Crisis." Harvey Wasserman. During recent days Extreme solar flares released Coronal Mass Emissions. Fortunately, they struck only glancing blows to our geomagnetic field. Had any scored a direct hit, many if not most of the planet's power grids would have failed for months. After two weeks a nuclear plant without grid power is a meltdown candidate. 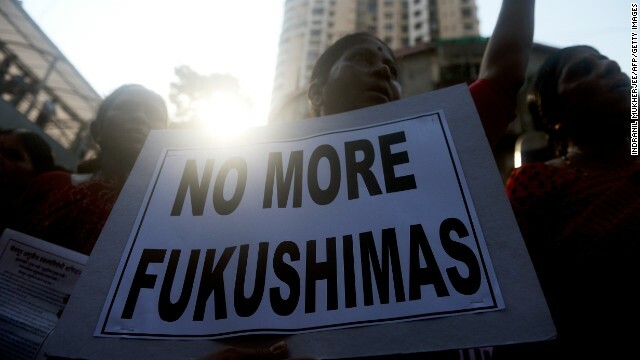 Hundreds of Fukushimas would become possible. Nuclear power is capable of ending human life on earth much faster than Global Warming. AESOP Institute is prototyping THE LITTLE ENGINE THAT COOLS. This engine will run on atmospheric heat, a form of solar energy. See the AESOP Institute website to learn more about this NO FUEL ENGINE. A 24/7 inexpensive power producing alternative to radioactive and fossil fuels. Fukushima fuel rods are scheduled to soon begin being removed. "Overall, more than 11,000 fuel assemblies are scattered around the Fukushima site. According to ...former Department of Energy official Robert Alvarez, there is more than 85 times as much lethal cesium on site as was released at Chernobyl. Source: Global Research We are now (approaching) what may be humankind's most dangerous moment since the Cuban Missile Crisis." Harvey Wasserman. Some roman guy in antiquity make up a wood bridge by falling a tree over a river. Not very good as a bridge, round, people fall down. Then he makes improvement, cut the top half to make it flat, had a cord left and right as a railguard. But people seeing the GEN 1 bridge , call for banning of that "newflangled and devilish" bridge technolgy as it is dangerous. Worst the gen 1 round bridge start rotting and become dangerous so people point finger at them and say they are inherently unsafe. By the time the engineer come up with the stone arched bridge, despite being very very safe in comparison to a simple tree felled over a river, it is too late, when people hear the word "bridge" they are running in circle like chicken little and screaming on top of their lung "the end is neigh". And at the same time since people STILL need to cross river, they swim across and drown in mass. But hey, at least they are not dying falling off a bridge. That's a good argument for solar and wind, but a poor argument for nuclear. The big difference is the level of risk to large populations. i was disappointed that the film assumed that those of us who have fought the nuclear power industry are all stupid. Many of us have fought concentration of plants far from where the power is needed. Many of us have proclaimed that conservation is essential to the future of the earth. Many of us hope to decommission existing plants when permits expire.I know no one who thinks human error won't happen. I live less than ten miles from three aging plants with problems. I know what can happen, and I know what has happened; and I know the government does not acknowledge the truth. The so called environmentalist on the show who supports nuclear power was making irrational arguments. He dismissed Three Mile Island by saying that he was only 8 years old when it happened, so he shouldn't be blamed for it! Does that mean it didn't really happen in his mind? Then he dismissed solar by saying that Nader has been promoting solar since the 70s.. so what's his point? That a technology can never get better and become viable? If so, we must not have air travel, home computers or telephones in our pockets. The worst part is, no one called him on any of these major flaws in his logic. The show could be interesting and valuable if they kept to guests who used ration and logic to make their points. I don't understand why nuclear power has to be a bad thing. We use this kind of power in US Navy vehicles and they don't have to worry about refueling issues around the world unlike surface ships and airplanes. Could we transfer the technology used for this program and make it civilian on a large scale? I can see issues with disposal of the waste since it won't be "safe" until long after our lifetimes. Maybe use desert areas that are not earthquake prone? Yes I am afraid of Nuclear Power. My name is Stephen Comley Sr. & founder of We The (WTP) People in 1987 a national whistleblower organization to investigate cover-ups by the Nuclear Regulatory Commission. (NRC & the unsafe conditions at U.S Nuclear Plants. I am also a nursing home administrator who am licensed by the State & Federal Governments to provide adequate evacuations at our family owned & run Nursing home in MA. .My investigations started after the fo0rmer executive director of the NRC informed to leave special needs residents behind at our Nursing Home & administer potassium Iodide to drink in the event of ta nuclear disaster at the nearby Seabrook nuclear plant in NH. I learned early on the NRC & the Nuclear Industry are willing to make a certain segment of our population expendable to protect the profits of the Nuclear Industry instead of the people's safety. The more I investigated the NRC & the Industry the more alarmed I got.. In 1987 I was given evidence by NRC informants the existence of counterfeit substandard parts which are present now in most U.S. nuclear Plants nationwide. Instead of the NRC requiring the I(industry to replace these bogus parts they downgraded the parts in order to save the cost of a million dollars a day to find & replace these parts.. WTP's work has been featured on the COVER of TIME & on CNN's Earth Matters entitled INSIDE THE NRC INTIMIMDATION OR REGULATION. In the interest of fairness & balanced reporting for you listeners Crossfire did not touch on any of these issues & I would like very much a opportunity to at least speak with someone at Crossfire. I know CNN would much rather help to prevent a nuclear accident in the US instead of reacting to one. Please contact me by my e-mail address scomleysr@yahoo.com or by my cell # 904-206-3114. Albert Einstein warned about the defamation and elimination of the world from nuclear power. Albert Einstein warned about the defamation that nuclear power will do within the world. A vast number of people don't focus upon World War II & why Einstein warned about losing the world. Nobody mentioned the huge mass of radioactivity in the Pacific Ocean that is making its way across from Fukushima towards the west coast of the US? Will people be able to swim off Hawaii? and later off California? CNN should broadcast a more factual and balenced documentary about Nuclear Power. Pandora's Promise is very questionable and it makes CNN look as if they are promoting antiquated, dangerous, expensive technologies that are generaly not accepted by most Americans. I think nuclear power is relatively safe and clean and would support the building of more plants. Of course I have the nimby stance: not in my back yard! I live in a congested urban/suburban area and think such plants should be built in uninhabited areas just in case a Chernobyl happens. Yes, I would be somewhat nervous living next to a Nuke plant. Also worried about the impact on the environment if a leak. Not for coal either. Why do we need to use Twitter or Facebook to respond to vote? I am not on Twitter and don't trust Facebook. You should allow for anonymous voting.